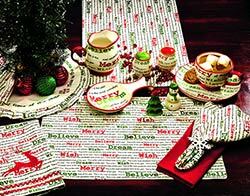 Set a fine holiday table with one of our Christmas placemats! 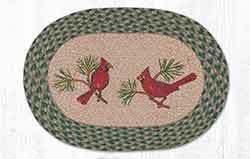 We have something for every theme - braided jute with snowmen and santas for a primitive look, burlap and woven cotton for country and farmhouse decor, even gold and metallics for a more upscale setting. The Carly Red Quilted Placemat Set stands out with intricate water quilting, the perfect backdrop for artfully designed florals. 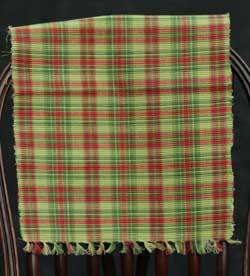 Christmas Tree Plaid Placemat, by Split P. The Christmas Tree Collection features a fun plaid of lime green, red, and Christmas green. 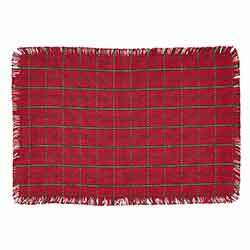 This is for the Placemat, which is ribbed with fringe on each end. 100% cotton. Measures approx 13 x 19 inches. Split P is a division of Park Designs. 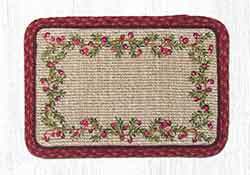 Sure to add whimsy to your holiday table, these placemats feature happy holiday words in a white, green, and red color palette. 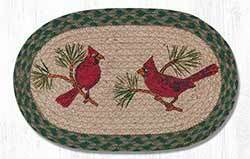 The Claren Placemat Set of 6 is a cheery but tried-and-true mix of red, green and tan. 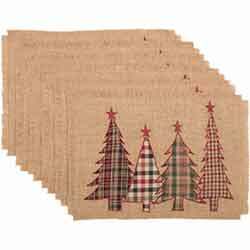 Natural jute is paired soft cotton to give the Clement Applique Tree Placemat Set a Christmas look. 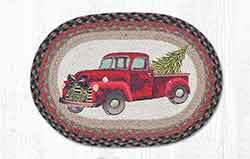 The vintage red and creme on each of the six Cookie Cutter Placemats is the base for four appliqued cookies each. 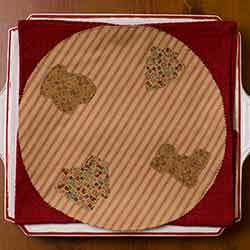 The vintage red and creme on each of the six Cookie Cutter Tablemats is the base for four appliqued cookies each. 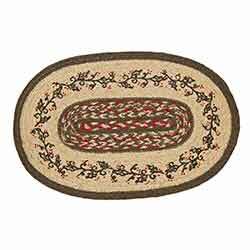 Add instant charm and personality to your table decor with our braided oval tablemats, featuring stenciled folk art in the center. 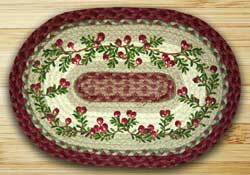 This one features a ring of cranberry vines designed by Harry W. Smith. 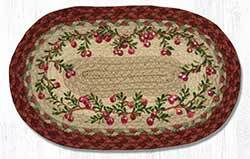 Features hand stenciled artwork of a vine of cranberries and leaves, with braiding in reds. The Creme Lace Deer Placemat Set features a large lace deer appliqued in the bottom right corner on a soft creme background. 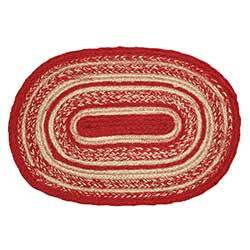 Cunningham Jute features natural and cherry red jute fibers that are plaited into solid and mixed braids. 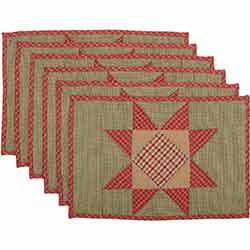 Cunningham Red Braided Placemats, by VHC Brands. 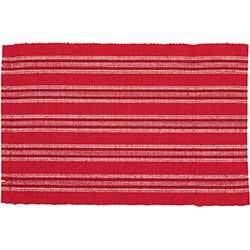 Set a beautiful, colorful table with thes pretty red braided placemats! Set of 6. 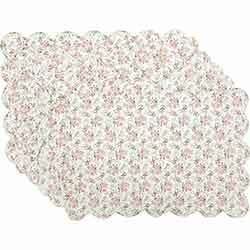 The Dolly Star Quilted Placemat Set is perfect for setting the table for a casual Christmas Eve dinner with the family. 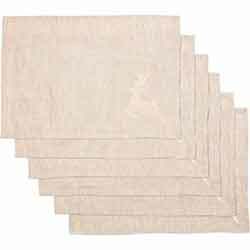 Dyani Champagne Placemats Set brings a Christmas touch to your dining table with braids of champagne jute blended with a metallic yarn. 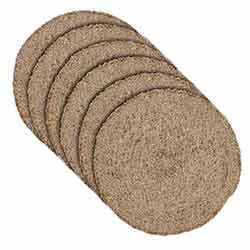 Dyani Champagne Round Placemats Set brings a Christmas touch to your dining table with braids of champagne jute blended with a metallic yarn. 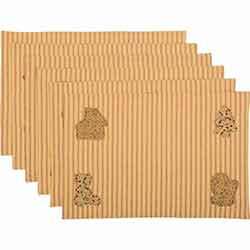 Dyani Gold Placemats Set brings a Christmas touch to your dining table with braids of gold jute blended with a metallic yarn. 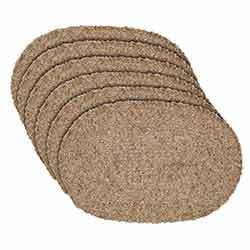 Dyani Gold Round Placemats Set brings a Christmas touch to your dining table with braids of gold jute blended with a metallic yarn. 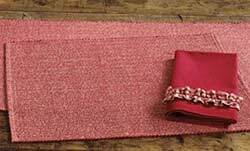 Dyani Red Placemats Set brings a Christmas touch to your dining table with braids of red jute blended with a metallic yarn. 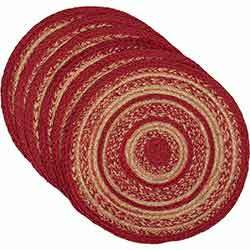 Dyani Red Round Placemats Set brings a Christmas touch to your dining table with braids of red jute blended with a metallic yarn. 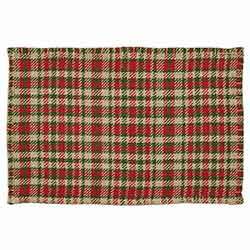 For a casual masculine look, we mixed traditional rustic colors with classic plaids and checks to create simple traditional pieces at home in a rural hearth or as rustic Christmas decorations. 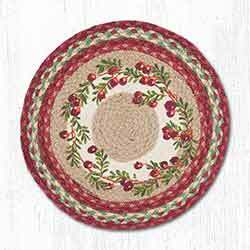 Add instant charm and personality to your table decor with our braided oval tablemats, featuring stenciled folk art in the center. 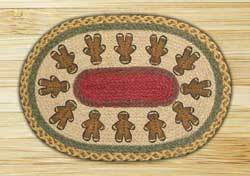 This one features a row of fat gingerbread man cookies designed by Susan Burd. 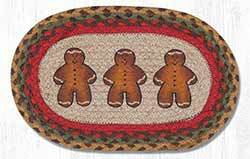 Gingerbread Men Braided Placemat, by Capitol Earth Rugs. Made of 100% natural dyed and printed jute. 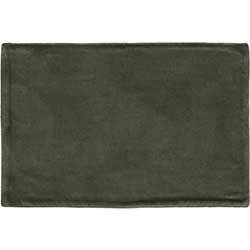 Heathered Ribbed Placemat, by Tag. 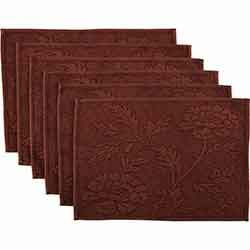 Ribbed placemat in heathered burgundy cotton. Part of the Woodland's Collection. 100% cotton, machine washable, line dry. Measures 14.5 x 19 inches. 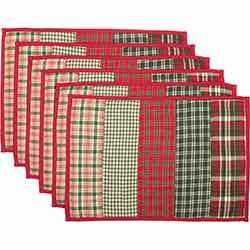 A red, green, and ivory plaid is bordered by festive ruffles to give the Hollis Placemat Set a timeless Christmas look. Remaining green all year round, holly has brought joy and hope into homes during the long days of winter for centuries. 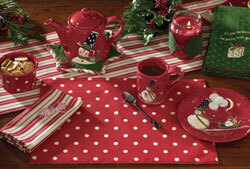 Holly Dots Placemat, by Park Designs. Bright and whimsical, Holly Dots is a fantastic holiday-inspired collection featuring rich red with white polka dots, and coordinating red, cream, and green stripes. This is for the Placemat, which is fully reversible - stripes on one side, polka dots on the other! Measures 13 x 19 inches. 100% cotton. Machine washable. Other coordinating linens also available! 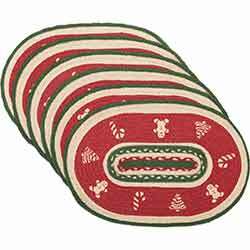 Add festive color to your holiday table with this set of 6 placemats, featuring a classic holiday color palette of Christmas red with thin stripes of white. 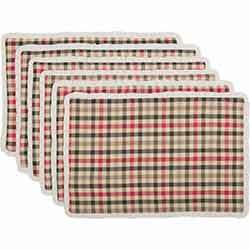 The Jasper Woven Placemat Set of 6 features a soft cotton twill weave in an oversized holly berry red, pure green, and gold Christmas tartan.